Five are “inherited” from my mother (and the slightly pitiful state of Fellowship of the Ring is my fault – I’ve read it rather too often, perhaps). 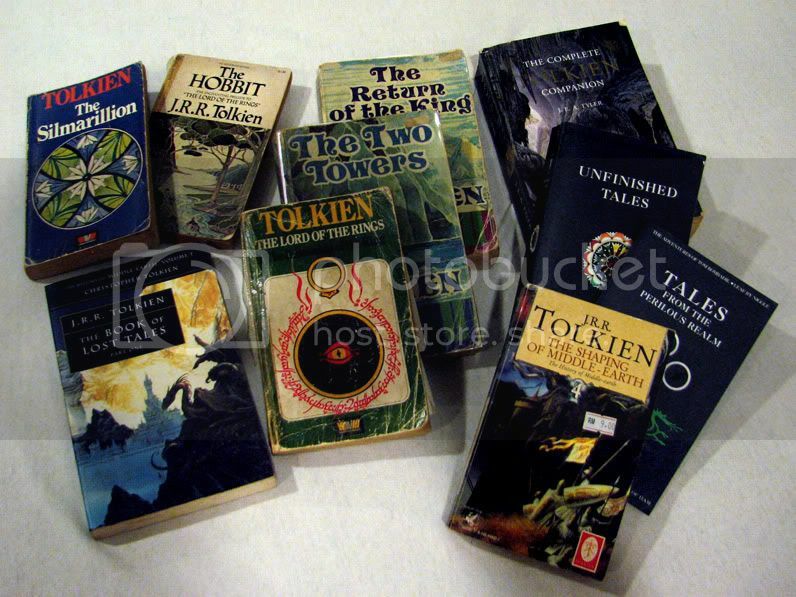 The Book of Lost Tales (Part One) and The Shaping of Middle-Earth were gifts. The Complete Tolkien Companion (it’s like an LOTR encyclopedia), Unfinished Tales and Tales from the Perilous Realm I bought myself. Remember all the karangan we used to write? Especially the autobiography type in primary school? The ones that inevitably began “Saya sebuah buku. Saya dilahirkan di sebuah kilang bersama buku-buku lain” and ended morosely, usually along the lines of “Saya tertinggal di dalam almari untuk beberapa tahun. Akhirnya, pada suatu hari saya dijumpai oleh ibunya di dalam almari dan dibuang bersama buku lama yang lain.” (I’m making the lines up as I go but I’m fairly sure we’ve all written some lame thing of the sort. haha) If the character was so unfortunate as to be something like a mere pencil, then the ending would be even bleaker – terjatuh ke dalam longkang or the like. hah. I sat on the shelf for a long time. I saw her come and go and wondered if I would ever be taken out and read again. Every now and then she’d look at me and smile, but she didn’t seem to have time to sit down and read the story anymore. The years went by and I thought my future grew ever bleaker. The other books around me were not particularly hopeful either. Then one day, she took me off the shelf! I was pleased, and also afraid. What if she wanted to throw me out? That would be worse than anything. Fortunately, she didn’t. She gave me to a young girl – her daughter – who looked a just a tiny little bit like her when she first picked me up, I thought. She was prettier than this girl though. This new girl surveyed my cover with a mixture of curiosity and doubt. I looked at her doubtfully too. I’d heard horror stories of other books being mistreated by new owners. Hopefully this girl wouldn’t be like that. Is that an insult? Is she insulting me? I do not like this kid. I know I’m a little worn, but what does she expect? I’m almost twenty years old now! Or maybe a little more; I forget exactly how old I am. Getting on in book-years. And the new girl started to turn my pages. If I could talk, I’d probably have started nagging her – be careful! They’re fragile! But I quickly realised that I didn’t need to. It felt like she too loved books… and it was as though she liked me even better because I was… me. In spite of my age, my yellowed pages, flimsy cover and dated cover art, she liked me. She liked me because I was old, because I’d belonged to her mother. Well, that was a new sensation. You know, us books, we don’t have much of an identity – what identity we have is derived largely in part from our owners. So from a book’s point of view, that’s rather like being loved just for being you – not just because you have a nice cover or because you have something they want. It’s a heavenly feeling. She picked me up at least once every year after that. She took me to university with her, and then back. Those were happy times. One day, eleven years after she first read me, she left and I didn’t know why. I didn’t see her for a long time. I started to wonder what had happened. The other books too. Only that Lewis book, Mere Christianity, and the Jane Austen masterpiece Pride & Prejudice had gone with her. Was I going to be just left standing there on yet another shelf again? This time it was worse because I never saw her at all. Maybe I’ll go read through the Tolkien Companion now. Or maybe The Silmarillion – it’s been a while since I read that. You know what’s good about books? They allow you to see and be in another world, they show you things you didn’t know before, and they don’t ever not have time for you. Books are never too busy, never get tired, never have other priorities besides their owners/readers. Only problem is… books can’t hug you.